French Polynesia is a French overseas "country" (French: pays d'outre-mer, or POM) in the southern Pacific Ocean. It is made up of several groups of Polynesian islands, the most famous island being Tahiti in the Society Islands group, which is also the most populous island, and the seat of the capital of the territory (Papeete). Between 1946 and 2003, French Polynesia had the status of an overseas territory (French: territoire d'outre-mer, or TOM). In 2003 and beginning of 2004 it was briefly an overseas collectivity (French: collectivitй d'outre-mer, or COM). The new status of overseas "country" gives a large autonomy to the territory, while remaining part of the French Republic. France annexed various Polynesian island groups during the 19th century. French Polynesia is located in an area of high seismic activity. In September 1995, France stirred up widespread protests by resuming nuclear testing on the Mururoa atoll after a three-year moratorium. The tests were suspended in January 1996, as France acceded the Comprehensive Test Ban Treaty. The islands of French Polynesia have a total land area of 4,167 kmІ (1,622 sq. miles) scattered over 2,500,000 kmІ (965,255 sq. miles) of ocean. It is made up of several groups of islands, the largest and most populated of which is Tahiti. 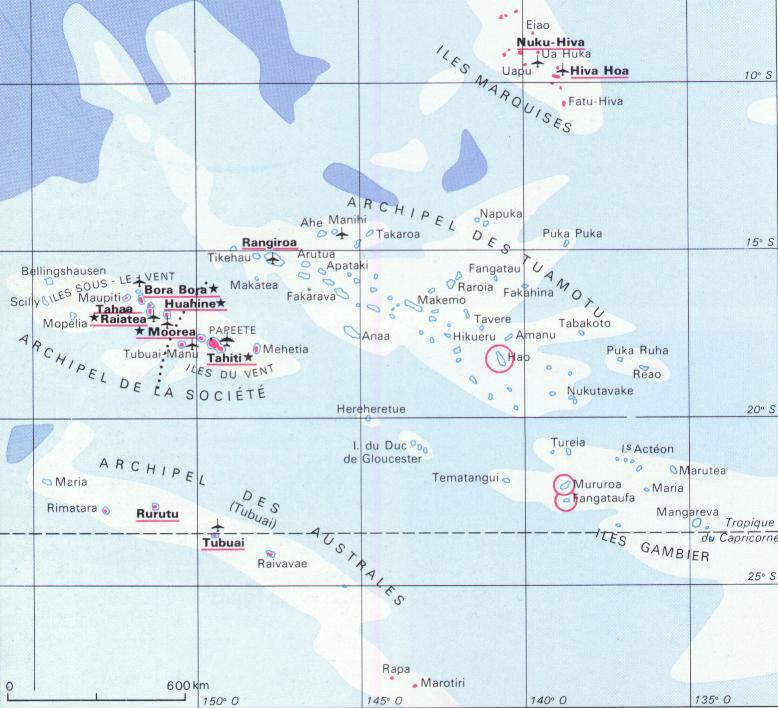 Important atolls and islands, and island groups in French Polynesia include Bora Bora, Hiva `Oa, Huahine, Maiao, Maupiti, Mehetia, Moorea, Nuku Hiva, Raiatea, Tahaa, Tetiaroa, Tubuai, and Tupai. French Polynesia has a moderately developed economy, which is dependent on imported goods, tourism and the financial assistance of mainland France. Tourist facilities are well developed and are available on the major islands. The legal tender currency of French Polynesia is the CFP franc; many merchants have been reported to accept other currencies very readily, but many tourists have been disappointed and inconvenienced on assuming they can use US dollars, etc. Few merchants actually wish to bother to calculate the current exchange rate and then make the foreign exchange at a bank. Total population at the 2002 census was 245,405 inhabitants, 83 % of whom are Polynesian, 12 % Caucasian, and 5 % Eastern Asian. In 2002, 69 % of the population of French Polynesia lived in the island of Tahiti alone. The urban area of Papeete, the capital city, has 127,635 inhabitants (2002 census). While most major roads are paved and well-maintained, many secondary roads are not. Traffic is brisk and all types of vehicles and pedestrians jockey for space on narrow streets. Crosswalks are marked and the law requires that motor vehicles stop for pedestrians; however, this is not always done. Tourists should exercise caution when driving, particularly at night. Education is also provided by France. French Polynesia has a University, the Universitй de la Polynйsie Franзaise (UPF, "University of French Polynesia"), located in Faa'a, Tahiti. It is a small university counting around 2,000 students. Luise Peltzer, former minister of culture of French Polynesia has been elected president of the University for 5 years. There are about 60 researchers at the university, including physicists Pascal Ortega (lightning studies) and Alessio Guarino (nonlinear physics). In the Human Sciences department, sociologist Laura Schuft deserves to be mentioned for her study on the integration of mainland French workers in Tahiti. French Polynesia has one of the lowest crime rates within France and its territories. However, petty crime, such as pickpocketing and purse snatching, occurs. Medical treatment is generally good on the major islands, but is limited in areas that are more remote or less populated. Patients with emergencies or with serious illnesses are often referred to facilities on Tahiti for treatment. In Papeete, the capital of Tahiti, two major hospitals as well as several private clinics provide 24-hour medical service. Serious medical problems requiring hospitalization or medical evacuation can cost thousands of dollars. Doctors and hospitals often expect immediate cash payment for health services. As an overseas territory of France, defence and law-enforcement are provided by the French Forces (Army, Navy, Air Force) and Gendarmerie.